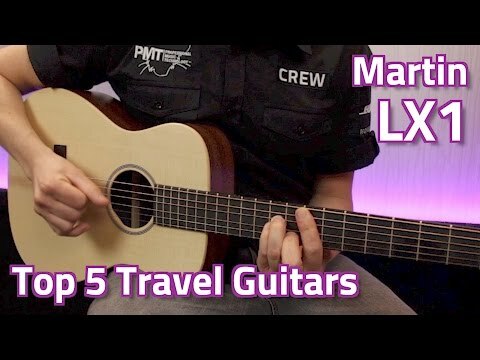 Martin LX1 "Little Martin", X-Series, Three Quarter Size Concert Acoustic Guitar The LX1 is the lighter, smaller 'travel' concert acoustic t.. The LX1 is the lighter, smaller 'travel' concert acoustic that every guitarist would love to have in their collection to play on around the house, in the car or on the move. Seeing a surge in popularity this past decade, thanks to a certain red-haired singer/songwriter from the UK, the Martin LX1 is the ultimate busking guitar, and can be yours for a fantastic price. Relatively small, lightweight, and comfortable to play, you only need play the Martin LX1 one time to see why it's such a popular choice. he resulting tonal balance and lightweight portability make the LX1 an extremely affordable guitar for smaller-bodied finger picking guitarists and strummers alike. Every aspect of the Martin LX1 follows the strict quality control evident at C.F Martin - incredible attention to detail, great wood choice and second to none craftsmanship. If you have any queries regarding the availability of this guitar then be sure to contact our online sales team directly. Alternatively order yours online today and make use of our fantastic range of home-delivery services!